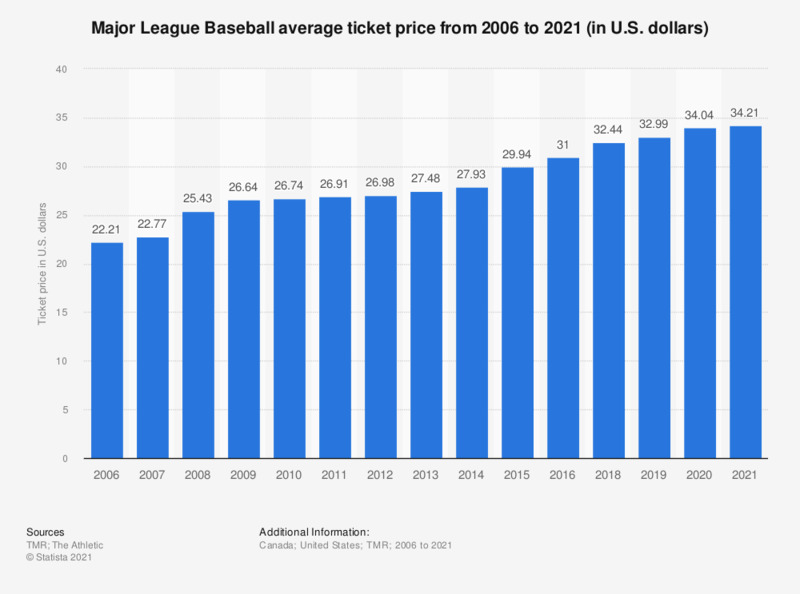 This graph depicts the average ticket price in Major League Baseball from 2006 to 2018. In 2018, the average ticket price was at 32.44 U.S. dollars. The average ticket price in the Major League Baseball has consistently grown over the years. Spectators paid an average of 22.21 U.S. dollars to watch a MLB game in 2006. In 201, the average ticket price is 32.44 U.S. dollars. The average annual revenue per team has consistently risen at a healthy pace as well, going from around 170 million U.S. dollars in 2006 to more than 315 million U.S. dollars in 2017. The ticketing revenue, on the other hand, has remained fairly consistent since 2009, varying between 2.25 to 2.8 billion U.S. dollars. Ticketing is a key revenue stream for the league. Its share of the total MLB revenue however has been declining since 2009, when tickets sales accounted for just over 38 percent of the league’s total revenue. In 2017, this figure is under 30 percent. The average ticket price per team varies greatly within the MLB. In 2017 the most expensive tickets - on average - were for the Chicago Cubs with an average price of 58.57 U.S. dollars. The Arizona Diamondbacks had the lowest average ticket price in MLB in 2017. The Boston Red Sox are the only other team with an average ticket price of more than 50 U.S. dollars. The Chicago Cubs also have the highest Fan Cost Index in the MLB, that is, the estimated costs for taking a family to a MLB game. A family of four would spent almost 370 U.S. dollars on tickets, refreshments and merchandise at a Chicago Cubs game in 2017. The New York Yankees have the second highest Fan Cost Index, with per game expense of 346 U.S. dollars.